During this interaction our CEO, Ashish Shah gave insights about his brainchild and also explained why Vertoz should be on the priority list of publishers and advertisers. What is so special about our offering? We offer programmatic advertising solutions which substitute the traditional methods of media buying and selling. All our advertisers can run campaigns on multiple channels on a publisher inventory across multiple devices like desktop, mobile, and tablets. Further, this helps advertisers and publishers to maximize their revenue potential. While programmatic is still budding out, we plan on making a foothold and create a demand in the market. Our cognizance edifices all the activities for programmatic advertising and encourages people to try it out and gain the benefits. Dataquest is an integral part of CyberMedia. CyberMedia is the largest specialty media house in South Asia and amongst India’s top five magazine brands. The group’s Media business includes twelve media properties including PCQuest, Global Services, DQ Channels, Voice&Data, DQ Week and Dataquest. Among all the top notch media houses, CyberMedia continues to innovate as a media enterprise, with a number of milestones to their credit. CyberMedia is also listed on NSE and BSE. 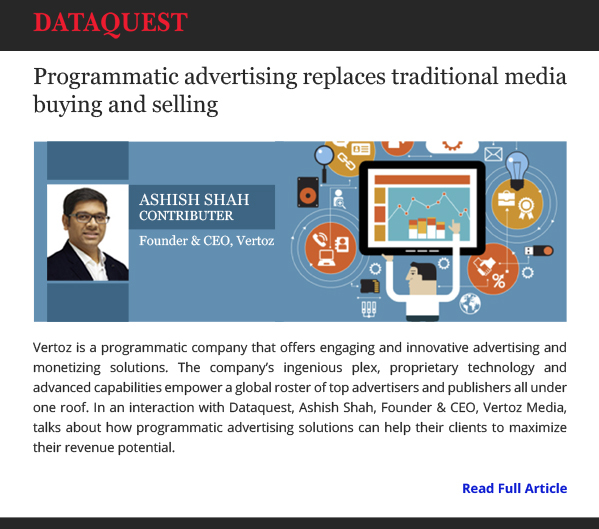 Vertoz is among the top notch programmatic companies that offer engaging and innovative advertising and monetization solutions. Our ingenious plex, proprietary technology, and advanced capabilities empower a global roster of top advertisers and publishers. If you are a publisher, we help you to monetize traffic from all the verticals and geographies to earn the best ROI. If you are an advertiser, then we help you to advertise your product on our self-serve programmatic plex and help you reach out to the right audience to get the best ROI on your advertising.